Former Aberdeen striker Hicham Zerouali has died in a car accident in Rabat. 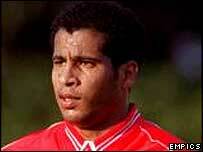 The Moroccan international, who was 27, played for Aberdeen between January 2000 and May 2002, scoring 13 goals. He was a great favourite at Aberdeen, where he was allowed to wear zero as the squad number on his shirt - a tribute to his nickname Zero. "Hicham was a lovely guy who was idolised by the fans here," said his former team-mate Russell Anderson. "He was back at at Pittodrie earlier in the season to watch a game and was in great spirits. "Our thoughts are with (the mother of Zerouali's daughter Anisa) Leone and the family at this tragic time." An Aberdeen spokesman told the club's official website: "Hicham was a prodigious talent who was loved and admired by everyone he came into contact with during his time at Aberdeen. "With the talent he possessed, there was still every possibility that he would be back playing for his country before long and for his life to be cut short in this manner is absolutely heartbreaking." After moving to Al Nasr in the United Arab Emirates, Zerouali returned to play in Morocco last year. He had scored twice on Saturday for his club Royal Armed Forces in a league match. He was also part of their trophy-winning side last month when they won Morocco's Throne Cup. Zerouali scored three goals in 17 appearances for the national team and played for Morocco at the 2002 African Nations Cup finals in Mali. He was also part of the national team last month when they played a friendly international against Burkina Faso.